These are two more Christmas presents that I made this year. They were made for two crafty ladies who have both had an incredible influence on my sewing endeavors. The top is a mini quilt for my dear friend, Dacia. I’m not sure where I got the idea for this one, but I’m quite happy with the result. I used an old CD to trace the circle shapes and then simply stitched them to the quilt using swirly free-motion designs. 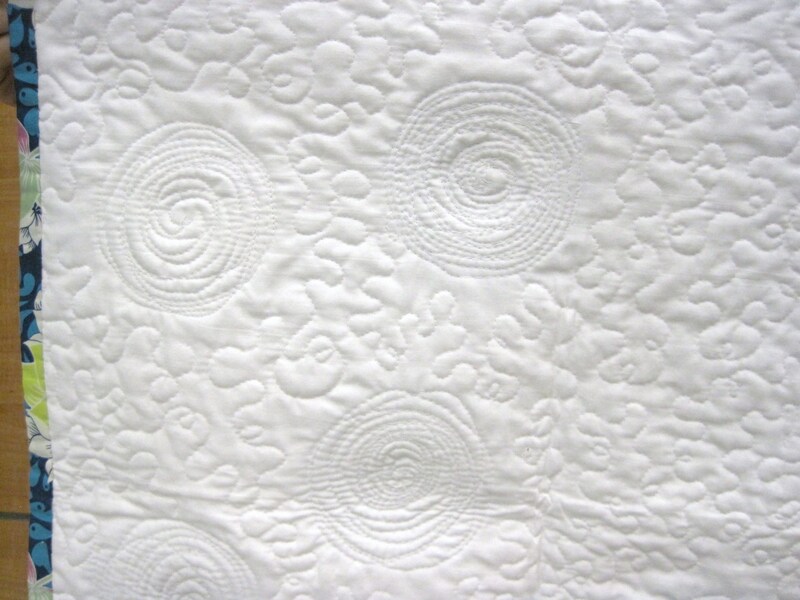 I then stipple quilted in between the circles, which helped to give the quilt some real texture. I love the way this one looks from the back! It’s bound in one of my newly discovered favorite fabrics (of the moment! ): Art Gallery’s “Wallpaper” by Patricia Bravo. The quilt on the bottom was made for my sister-in-law, Emily, in hopes of brightening up those long (dark) winters in Denmark. My brother and his wife moved to Denmark for a job last February. Only a few months later, Emily and Aaron had their first son, Ethan. Denmark is situated on the same latitude as Alaska, which means that in the wintertime they sometime have only 6-8 hours of light a day. I was hoping she could hang this in the kitchen or main room to offer a bit of a sunny scene. I used Ashley’s great tutorial for making a string quilt block to construct this mini quilt. Rather than using paper to foundation-piece these blocks, I used a lightweight muslin. That way I didn’t have to rip out the paper afterwards. I’m itching to get started on another mini quilt. These are so much fun to make and finish up so much more quickly than a full sized quilt. 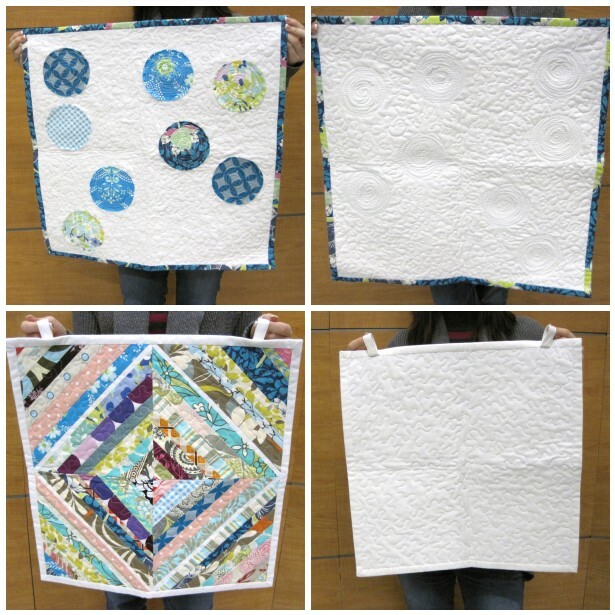 Does anyone know of any great mini quilt patterns or have any photo inspirations they can share with me? I’d love to see! Post a link in the comments, if you like. I also love small quilts! Go to flickr and search “doll quilt” That oughta keep you busy for a year or so… There’s even a doll quilt swap on there that I’ve done before. Love it! 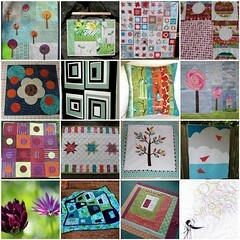 Small quilts are great and if you want a ton of inspiration, check out ones made for the Doll Quilt Swap over on flickr. 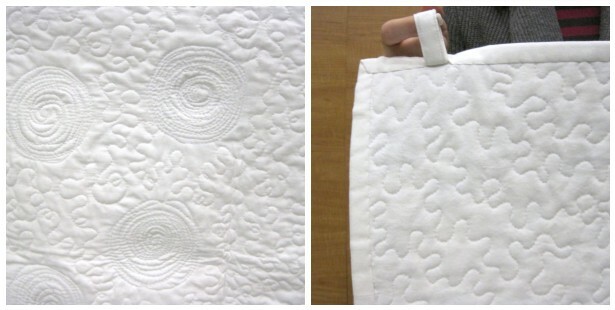 I love the swirly circles on Emily’s quilt! I love my quilt! I look at it everyday and it brightens the room up. Way to go, Sis! Gorgeous! I love mine. Thanks so much, Sarah! You are such a great friend and crafty lady!